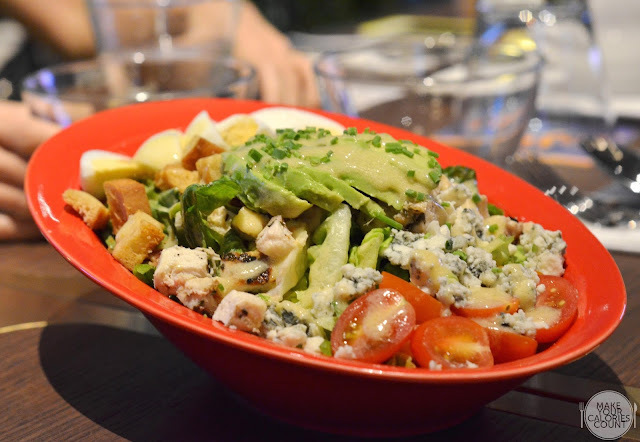 While there are quite a few restaurants in Singapore claiming to offer the American dining experience, you know you are in safe hands when the owners originate from US. Not only did they bring their home-style cooking methods and recipes to a cosy space at newly renovated Claymore Connect, they also brought along experienced Chef Nicolas who has 18 years of culinary experience under his belt. 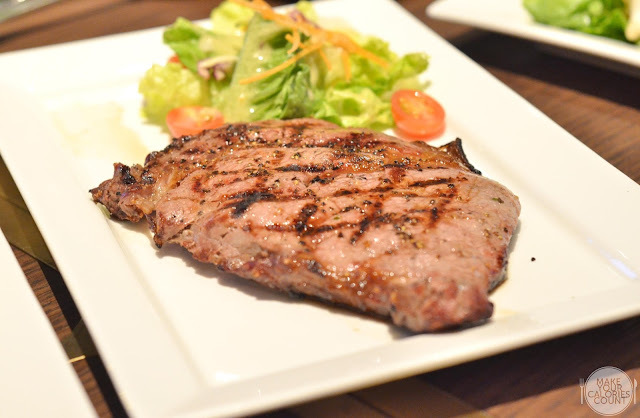 Drawing on Chef Nicolas' expertise in grills, he specialises in dishing out quality steaks and seafood. 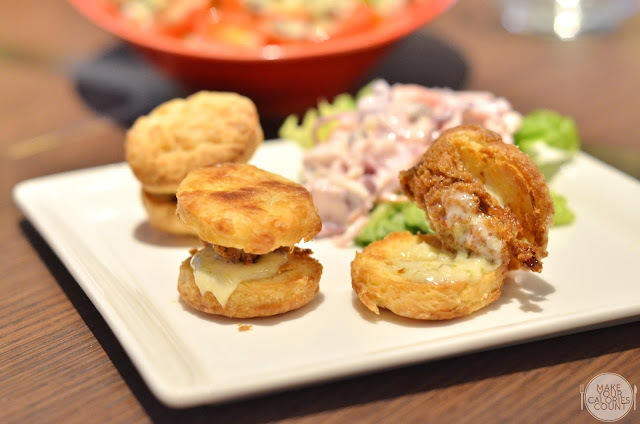 With classic recipes and traditional methods that have been passed down for generations by owner John's family, expect many familiar East Coast favourites such as Virginia-style crab cake and oyster biscuit on the menu. With a focus on the food rather than sauces, RedBank believes in quality ingredients speaking for themselves and takes pride in that. Let the calories do the talking then! For those familiar with American biscuit, they are somewhat similar to the British scones only different with the pairing of food. While both are quickbreads made with flour, butter and fat, baking powder and buttermilk in this case, the American biscuit is really an everyday carb that serves the same purpose as our breads, only more for the savoury dishes. While we enjoyed this oyster biscuit, we felt that the proportion of the oyster, which is fresh and deep-fried, to the American biscuit was slightly off, hence we were left wondering which is the supposed star of the dish since both tasted great. Some classic appetisers which the Americans might be familiar with - not so for us but we do appreciate quality calories when it come our way. 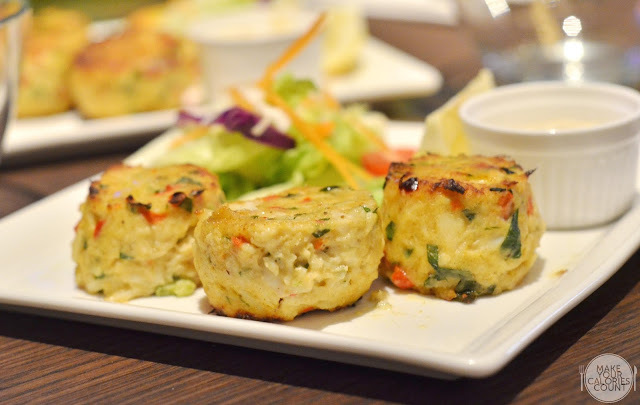 We enjoyed the freshness of the crab meat and how it was neatly packed to form a very satiable bite while sipping some wine or beer as the mains are being prepared. Served with a light mayo on the side and do give that wedge of lemon a squeeze for the acidity helps balance out the robust flavours of the crab meat. An inspiring story about how this salad was created - all leftovers found in the fridge were tossed together and there we go. The usual culprits for a very generous portion were there of course - iceberg, cherry tomatoes, avocado, egg, bacon, cheese, chicken and of course some crispy croutons. 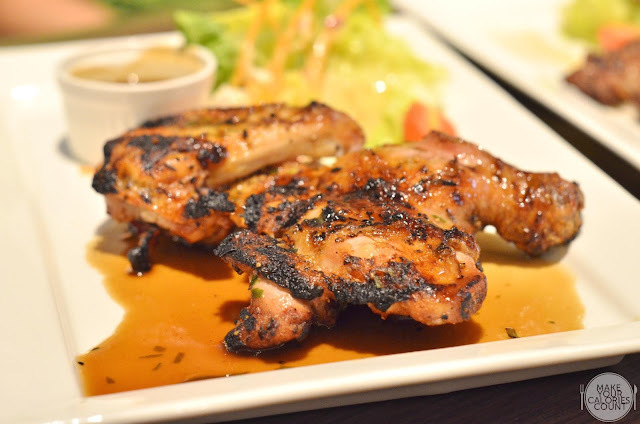 For the mains, each grilled meat comes with a side of fries while the seafood and poultry mains come with a choice of rice pilaf or fries. Trust me, you would want to give the other sides on the menu a try because they sure were calories worthy! Baked potatoes are a common sight but twice-baked, not so. What makes it special is not that it was baked twice but the lovely emmental cheese that was added together with a beautiful sour cream and chives that complement. The potatoes retained a much-desired crisp texture that juxtaposed the soft and mashy carbohydrate. 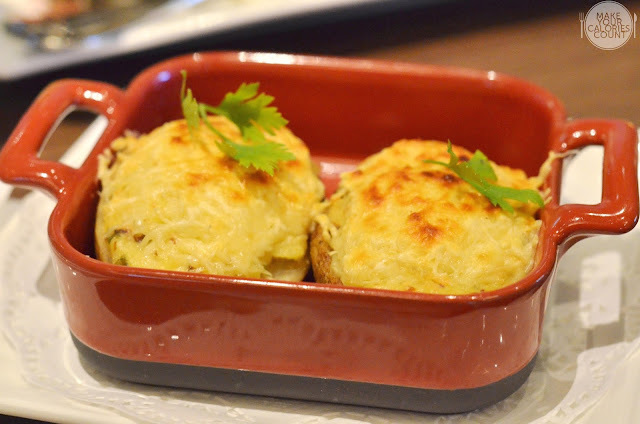 A must-try for potato and cheese lovers! 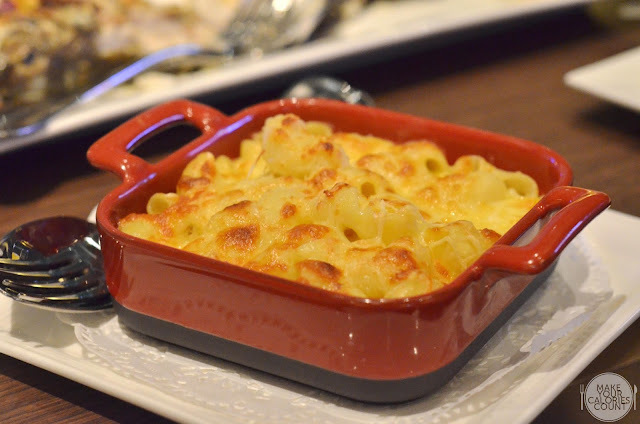 Honestly, I am not a huge fan of cheese but for those have a penchant for mac & cheese, this dish is sure to delight! When I heard that we were served hush puppies, it was no surprise that everyone at the table cast discerning stares at the serving waitress. 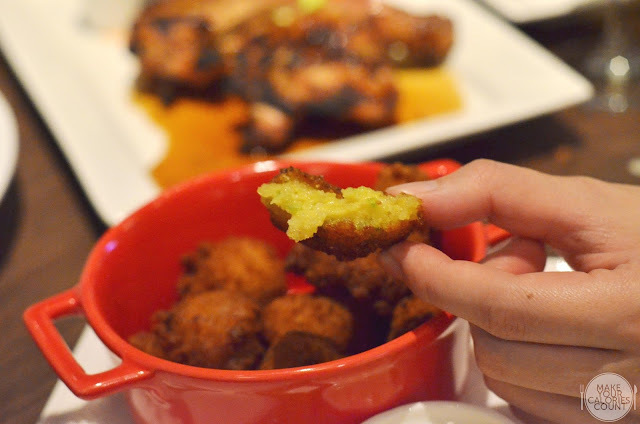 In fact, hush puppy or cornbread ball is a savoury side made from cornmeal batter deep-fried or baked. The dish derived its name from the creators ranging from hunters, fishermen to cooks who would fry some cornmeal mixture and feed it to their dogs to "hush the puppies" during cook-outs or fish-fries! We loved the soft mashy texture on the inside and the gorgeous golden-brown tan and crisp surface of the hush puppy! Using Josper grill, one of the best in the world for grills used by top chefs and restaurants such as Heston Blumenthal's kitchen at Mandarin Oriental in London, it was no wonder that the meats were cooked to perfection. The beauty of the oven-like grill machine is the two adjustable draughts - one at the bottom to draw in air and one on the top to let out smoke and combustion gases which operates in a similar fashion to the Aga cooker - a staple in English country kitchens! The lovely crisp skin on the succulent chicken made this dish one of my favourite dishes of the night. Spotting a beautiful char, it was perfectly balanced with a white wine reduction. 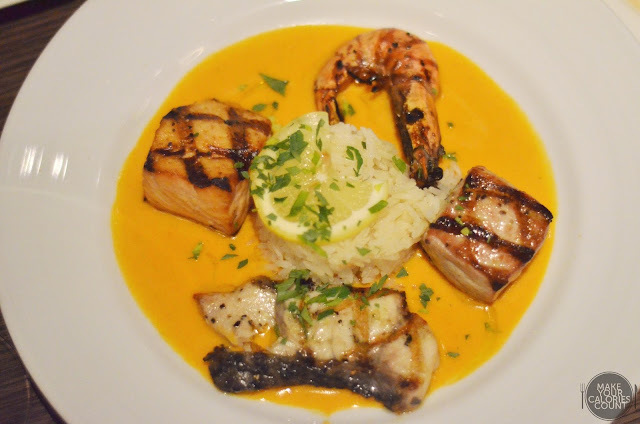 For those who love their seafood, go for the mixed seafood grill which has a sizeable chunk of prawn, salmon, sea bass and tuna with a cup of pilaf rice dressed with capsicum sauce. It is hard to resist slicing through a beautifully grilled steak - just look at those nice criss-cross lines that charred the tender meat. Cooked to perfection, medium rare, it was a succulent slice that made me return for more. Sharing the philosophy that less is more, Chef Nicolas adds little seasoning to his quality ingredients with just salt and pepper, allowing the cut to shine on its own merits. When it comes to American dining, expect portions to be magnified and desserts are no exception. 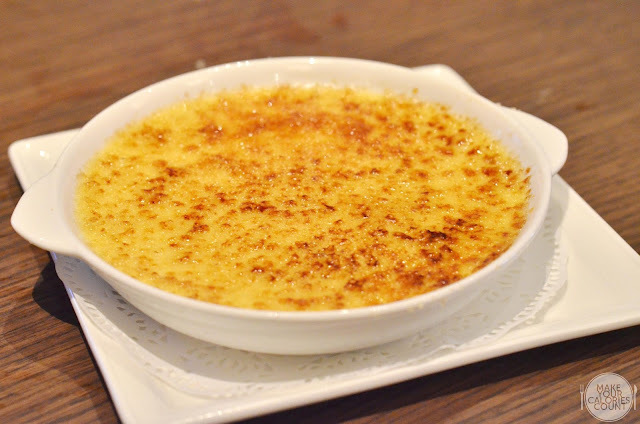 A perfectly done creme brulee that has a rich custard base and topped with a caramelised crust. 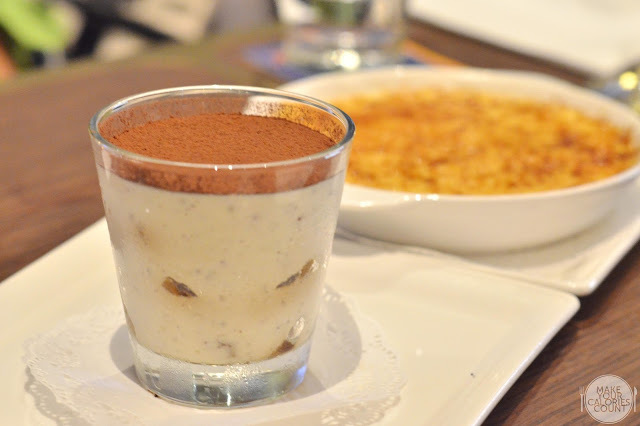 Whilst innocent-looking, this glass of sinful calories is rich with flavours and the chocolate chip added a variation in texture to the otherwise velvety tiramisu. A must-try for coffee and chocolate lovers! One of my favourite desserts after a rich meal - a refreshing citrus treat. The lemon pie here surely fit the bill with a nice tang that was enough to please everyone's palate. 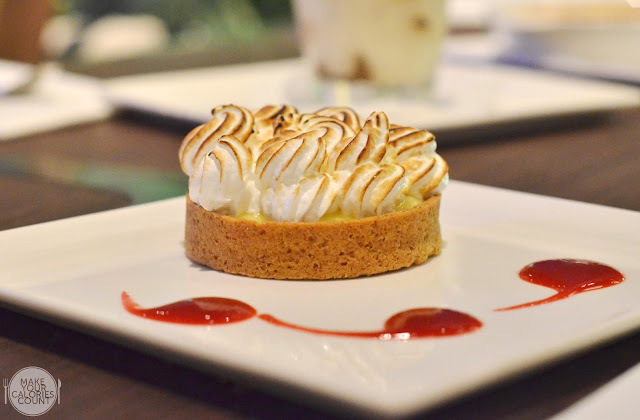 The firm golden brown crust contrasted beautifully with the lemon curd and soft meringue. 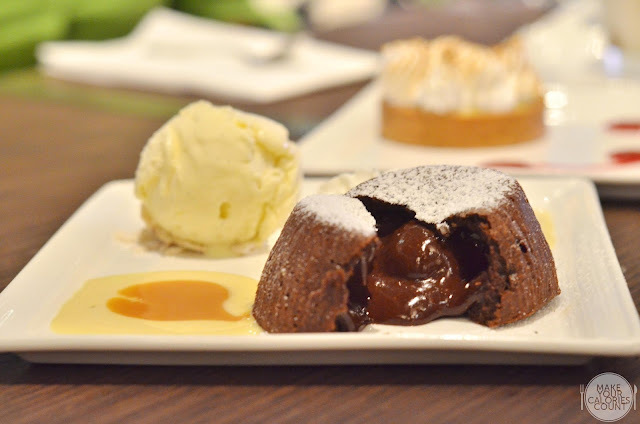 After trying one of the best chocolate lava cakes at Bistro du Vin, we struggled to find a comparable rendition but this was a close match. 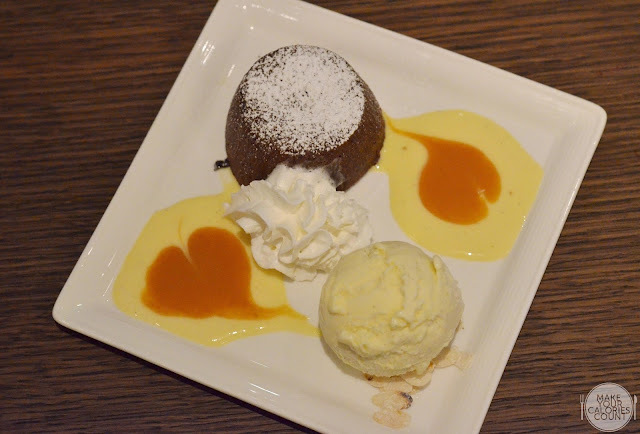 We loved the crisp surface of the chocolate lava cake only to be complemented by the viscous chocolate lava on the inside. Spotting a cosy ambience, one of the first few realisations during dining was that the tables were spaced out quite distantly so diners could expect privacy. 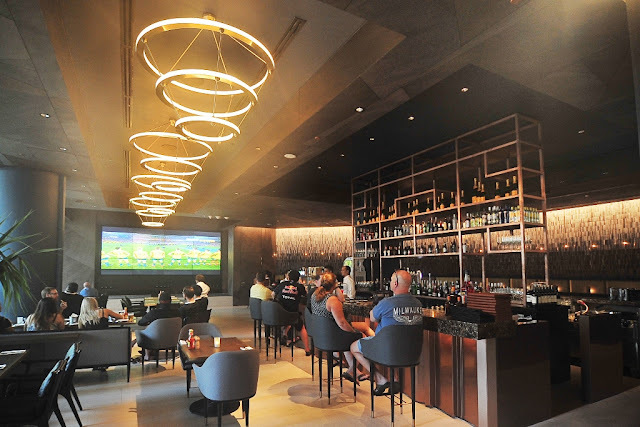 From time to time, there are also live band performances else it is the perfect venue to catch a football or sporting games! P.S: Special thanks to Melody for the invite and RedBank for hosting us. I totally agreed with you on the oyster biscuit.